The 1987 World Series was the 84th edition of Major League Baseball's championship series, and the conclusion of the 1987 Major League Baseball season. It was a best-of-seven playoff played between the American League (AL) champion Minnesota Twins and the National League (NL) champion St. Louis Cardinals. The Twins defeated the Cardinals four games to three to win the Series. Twins pitcher Frank Viola was named as the 1987 World Series MVP. Minnesota was victorious in a World Series that was the first to feature games played indoors. It was also the first World Series in which the home team won every game; this happened again in 1991 (also a Twins championship, this time over the Atlanta Braves) and in 2001 with the Arizona Diamondbacks defeating the New York Yankees. The 1987 World Series was notable in several regards: It featured the first World Series games played in an indoor stadium (the Hubert H. Humphrey Metrodome) and, to date, the last World Series game to start earlier than prime time in the eastern United States (Game 6 would start at 4:00 p.m. ET/3:00 p.m. CT), and it was the first World Series in which all games were won by the home team. (Four previous series had the home team winning the first six games, including the 1965 World Series, when the Twins dropped Game 7 to the Dodgers.) The bottom half of the ninth inning was never played in any game of this Series, and this was the first and only time this has ever happened. In 1987, the Twins set the record for the worst (full 162 game) regular season win-loss record of any World Series championship team (85–77, .525). This record stood until it was broken when the Cardinals won the 2006 Series after going 83–78 (.516). However, the latter was due to the incorporation of a third division in each league, which did not exist in 1987. A raucous, sold-out Metrodome met the Cardinals on October 17, stunning them at times with the sheer noise. The crowd noise in the Metrodome could exceed 110 decibels, which is about the same as what a jet plane makes when it takes off. Their play was marred with numerous mistakes brought by the Dome's fast AstroTurf and white roof. The Twins' aggressive play hardly helped the Cards at all, and the game was a 10–1 blowout. Starting pitcher Frankie "Sweet Music" Viola put the lights out on the Cards easily. Dan Gladden hit a grand slam capping off a seven-run fourth inning and Steve Lombardozzi added another two-run shot. The Twins then blew the game open in the sixth. Greg Gagne led off with an infield single and Puckett walked. A passed ball by Tony Peña advanced the runners. 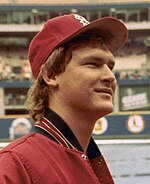 With first base open and one out, Cards veteran Bob Forsch intentionally walked Baylor to load the bases. After Brunansky popped out, left-hander Ken Dayley was brought in to face the lefty-hitting Kent Hrbek. Hrbek finally broke out of his batting doldrums and hit a grand slam. The 500th World Series game ever played, Game 7 forced a National Football League game between the Denver Broncos and the Minnesota Vikings, originally scheduled for that afternoon at the Metrodome, to be played the following night (also on ABC). The sixth inning proved to be controversial. In the top of the sixth, Tom Herr was picked-off of first base, and tagged out in a rundown. In what Cardinals fans believe was the third missed call of the game, Herr got in the rundown and Lombardozzi ran him back to first where Kent Hrbek was standing off the bag near the basepath. Lombardozzi tossed the ball towards Hrbek and the ball sailed past him but into the glove of Viola behind the bag. Viola had come over to take part in the rundown. Herr was hindered by Hrbek returning to the bag, but clearly reached the bag safely before Viola tagged him. However, first base umpire Lee Weyer called Herr out. Weyer's view was blocked by Kent Hrbek and, according to the broadcast crew, Viola made the tag late and Hrbek should have been called for interference. Had this been called, Herr would have been safe, awarded second base, and the Cardinals would have had a runner at second with one out. As it was, the Cardinals would score nothing. The Twins then took the lead in the bottom of the sixth, off Danny Cox, who had relieved Magrane the previous inning. Cox walked Brunansky and Hrbek to lead off, and was replaced by Todd Worrell. As Cox was leaving, he got into an argument with home plate umpire Dave Phillips and was ejected as he was leaving the field. After retiring the first batter he faced, Worrell walked pinch-hitter Roy Smalley and struck out Dan Gladden for the second out. The next batter, Gagne, reached first on an infield hit as Brunansky scored the go-ahead run. By winning in the regulation nine innings, the Twins ensured the 1987 World Series was the first in which no games needed the bottom of the ninth inning. No other World Series since then has had that happen. After their defeat in the '87 Series, the Cardinals' reign of dominance in the '80s ended. They would not win their division again until 1996 and they would not return to the World Series until 2004. ^ Nemec, David; Flatow, Scott. Great Baseball Feats, Facts and Figures (2008 ed.). New York: Penguin Group. p. 365. ISBN 978-0-451-22363-0. ^ "BaseballLibrary.com 1987 Twins". Archived from the original on July 4, 2004. Retrieved November 28, 2004. ^ "Ericson admits to adjusting ventilation system". ESPN. ESPN. July 26, 2003. Retrieved March 24, 2015. ^ "1987 World Series Game 1 - St. Louis Cardinals vs. Minnesota Twins". Retrosheet. Retrieved September 13, 2009. ^ "1987 World Series Game 2 - St. Louis Cardinals vs. Minnesota Twins". Retrosheet. Retrieved September 13, 2009. ^ "1987 World Series Game 3 - Minnesota Twins vs. St. Louis Cardinals". Retrosheet. Archived from the original on September 26, 2009. Retrieved September 13, 2009. ^ "1987 World Series Game 4 - Minnesota Twins vs. St. Louis Cardinals". Retrosheet. Retrieved September 13, 2009. ^ "1987 World Series Game 5 - Minnesota Twins vs. St. Louis Cardinals". Retrosheet. Retrieved September 13, 2009. ^ "1987 World Series Game 6 - St. Louis Cardinals vs. Minnesota Twins". Retrosheet. Retrieved September 13, 2009. ^ "1987 World Series Game 7 - St. Louis Cardinals vs. Minnesota Twins". Retrosheet. Retrieved September 13, 2009. ^ "ESPN.com - MLB Playoffs 2002 - Calm, cool Lackey looks anything but a rookie". ^ "Al Michaels says Twins pumped fake noise into 1987 World Series". Archived from the original on September 25, 2015. Retrieved February 7, 2015.